“Your Network determines your net worth” is the most powerful statement I have ever read in business. I worked for one of the top accounting firms, PricewaterhouseCoopers, and my focus in the Mergers and Acquisitions (M&A) department consisted of writing winning proposals. In writing proposals one of the keys to being successful at it is doing your homework – clear, concise research. I found in my position I was always faced with this question while doing my research – who is doing well in the market right now? Then I was faced with the second question – who is doing better? The bottom line became how will it benefit he who is doing better to collaborate with he who is doing well and how do I convince them to come together? To understand this concept you have to know that M&A doesn’t always happen because a company is failing and the only way for them to survive is to be bought out or combined with a company that is doing much better in the market. M&A also takes place between companies that are doing extremely well. Why? Corporations have recognized when they combine their efforts and strategies they can grow rapidly in their industry. That goes back to that age old concept that two heads are better than one. When you make a collaborative effort with another organization you increase your man power, your talent pool, your resources, your strategies, etc. So what do words like network, net worth and collaborative efforts have to do with Independent Music Artists and Labels? It’s a clear concept and I am sure most have figured it out already, but figuring it out is not the key. The key is actually doing it! If your network of people that you do business with in this industry is solid, on point and running in the same direction as yours and if your network compliments your business, you have the makings of a powerful team. You have to align yourself with individuals who share the same dream and drive. When you collaborate with people who are on that same page you increase your visibility and opportunities tremendously. So often, we forget that it takes a team of people to build success and we try to do it on our own… all alone. That method gets you nowhere fast. First, we have rid ourselves of the attitudes that we don’t need anyone to be successful in this industry. Once we realize the benefit of working with others, it is time to put it into action. Utilize every opportunity you encounter to network with others. You never know what relationships will build from there. When you show support for others in this industry, if you have made careful selections and screened properly, you will find that they will return the favor. Imagine for a moment all of the major success stories and think of how they formed a network and collaborated together to build in this industry. Just to name a few Jay Z, Kanye West, Lil Wayne, Drake and Common. Somehow all of these individuals found ways to collaborate and build with others and even one another. When you hear one person dropping something the other is featured and then a piggy back follows with the featured artist’s new album. Old game… and guess what it’s still the same. If we think on a local level, I will use Houston because that’s where I currently reside; Wreck Shop collaborated with many artists and non-artists to create a buzz for their company. 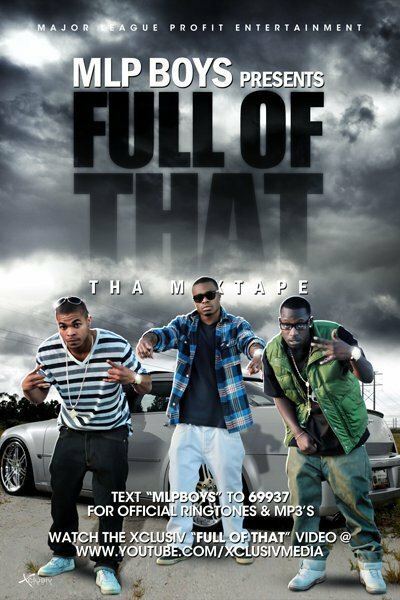 They generated some buzz through Fat Pat; however, they capitalized on that buzz by dropping a movie, The Dirty 3rd. In doing that movie they worked with a lot of people in the Houston and surrounding areas to make it happen – from Slim Thug all the way to the camera crew, actors and actresses. A lot of people may not know that there was never a script for that movie. However, Wreck Shop worked together with all involved in the movie to come up with lines, shots and strategies for the movie. Seemingly the movie was low budget, but it served its purpose. It created a huge buzz for Wreck Shop Records at that time. In saying that, I will also say when you create these opportunities continue to nurture and grow them because just as easy as it is to blaze the scene and create a huge visible force, it is just as easy to turn the lights off on your success. Stay determined, focused and never lose the drive, hunger and passion for your craft! 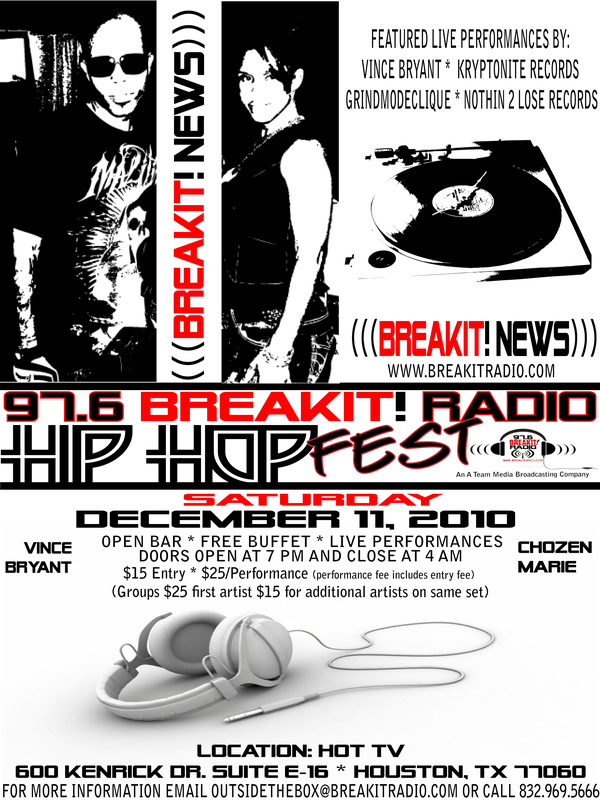 SATURDAY, DECEMBER 11, 2010, AT 7:00 PM, 97.6 BREAKIT! 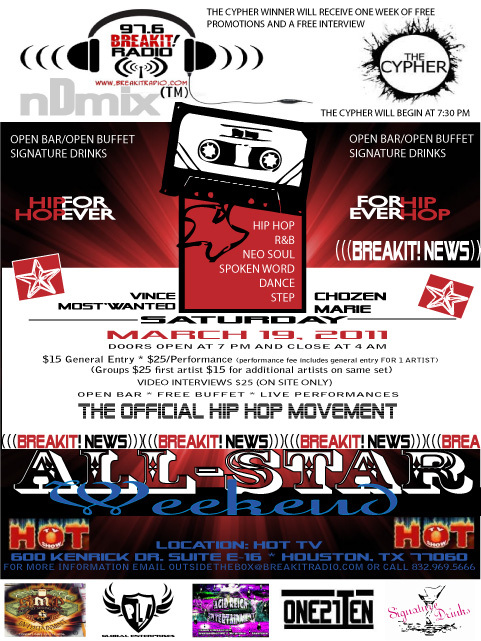 RADIO WILL HOST ITS OFFICIAL HIP HOP FEST AT HOT TV, LOCATED AT 600 KENRICK DRIVE, SUITE E-16, HOUSTON, TX 77060. BreakIt! Radio invites the community out to enjoy Independent Artists as they break their talent on the Hot TV stage along with HIP HOP professionals such as Vince Bryant, Kryptonite Records, Grindmode Clique and Nothin 2 Lose Records. This event will be another to remember. Where else can you go get free “real” food, free drinks, great entertainment and a fun atmosphere for only $15.00? 97.6 BreakIt! Radio is setting a tone to push competitors to step up their game. With the recent loss of my grandmother, a friend told me to keep PUSHING…. Today hearing the words in the letter my grandmother left for us is confirmation that MY GRANDMOTHER would want me to keep PUSHING this MOVEMENT. Everything about this MISSION is what she instilled in me as a little girl… LOVE… UNITY… FAITH. I have FAITH that we can do what some deem to be the impossible. We have seen it already… people coming together as family… the display of love and respect…. and faith in this MOVEMENT by so many people. WE are ALL PUSHING the MOVEMENT! 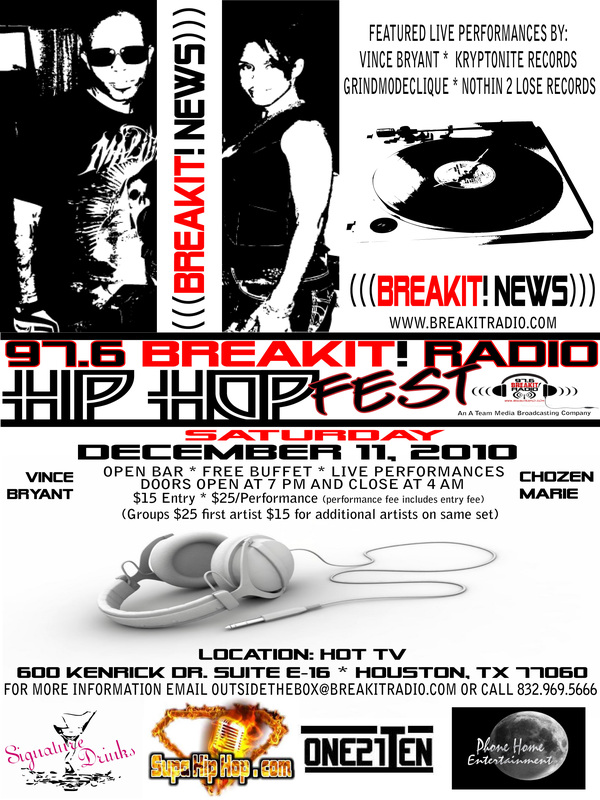 SATURDAY, NOVEMBER 6, 2010, 97.6 BREAKIT! RADIO BROUGHT ITS OFFICIAL KICK OFF PARTY TO HOT TV, LOCATED AT 600 KENRICK DRIVE, SUITE E-16, HOUSTON, TX 77060. BreakIt! Radio invited the community out to enjoy Independent Artists as they broke their talent on the Hot TV stage along with HIP HOP professionals such as K-Rino and Vince Bryant. Special performing guests Golden Boy, Supa Sammy Veal of Kryptonite Records, Sho Stoppa, Young Solar and Yung Tonka blazed the stage in a HOT way. 97.6 BreakIt! Radio, an affiliate of A Team Media and Broadcasting Company, stood right at the forefront of history , changing the face of entertainment as we know it. As a prominent force in their stance on the HIP HOP Revolutionary Movement, the breaking new radio station is set to revive HIP HOP globally, as well as give indie artists an avenue for exposure – breaking them into the industry. In association with Breaking the Labels, the station owners, Vanessa Chozen Marie and Vince Bryant are dedicated to utilizing the station as a vehicle to “power” the voices of the people in many aspects. The two recognize music and entertainment as vehicles for fueling the MOVEMENT. Through music and entertainment the two are working to positively impact the local community and abroad. With a full house at Hot TV on November 6, the voices of Indie Artists, the community and entertainment supporters were heard loud and clear. Since the Kick Off Party took place the internet (Facebook and Twitter) and the streets have been blazing with talk on the success of the event. More importantly, people are discussing the change in media and the representation of Indie Artists in the Houston and surrounding areas. Artists from Houston, San Antonio, Austin and Dallas came out to support and represent their talent live. The Hot TV stage was laced with pure talent from Indie Artists as K-Rino performed with precision and a verbal eruption, spitting true knowledge. Vince Bryant, showcasing his verbal diversity ignited the crowd performing hits like GoodTimes, produced by the “JDilla Reincarnated” producer, Jeffrey Sadik McNeil. Long term relationships were made at this event and continue to build as artists are coming together to show love and respect for one another. This event proves to be the beginning of many more successful artistic collaborations and events held in conjunction with 97.6 BreakIt! Radio, Breaking the Labels and HOT TV. In this defining moment where all African American-owned media, entertainment and broadcasting companies are making history in Houston and the Gulf Coast Region, the owner of Hot TV (Houston’s Own Talent), Malik Rasheed, who has been a pillar in the community for surrounding artists has moved the Hot TV Show to Channel 21 (UTN – Urban Television Network), an all African American-owned TV network seven days a week. 97.6 BreakIt! Radio is proud to be a part of this historical moment, hosting the 97.6 BreakIt! Radio Kick Off Party at the very home that has been an avenue since 1999 for Houston artists to gain exposure. Trust there is a shift in media, broadcasting, TV networking and entertainment. No truer words have ever been written. The Houston community is standing behind 97.6 BreakIt! Radio, Hot TV, UTN 21 and the Breaking the Labels MOVEMENT to EMPOWER change and to have their voices heard in a major way. 97.6 BreakIt! Radio Red Carpet History Making Sponsors for this event were Nothin 2 Lose Records (Jason “JBlak” Jackson, Dwight Facey, and Justin Rimer), Real McCoy Entertainment (Blue Royale, Cori Wilikins, Shereece Campbell “MamaStackz”) and Tattoos by Kevo (Kevin Byrd). Additional sponsors for the event are Fever Entertainment (Jay Merchant) and Black on Black Entertainment (Wood Real). For more information regarding 97.6 BreakIt! Radio, contact (832) 969-5666 or email outsidethebox@breakitradio.com. To become a sponsor, vendor or to advertise your business, contact Vanessa Chozen Marie at (832) 969-5666.